This was a story about a young family that has outgrown their current home however they didn’t think they could purchase another home in this market. 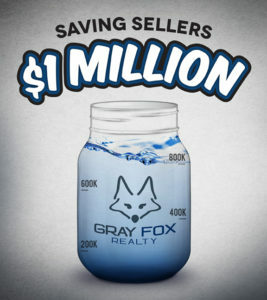 When they reached out to Gray Fox Realty they were interested in the Full-Service, Flat-Fee model that Gray Fox offers. In the initial in-home consult with this family Mike and I were able to understand the goals and desires of this family and immediately put together a plan to help them achieve them. The first thing Gray Fox had to do was determine what it was going to take to get their current home prepped and ready for market. Mike and I did a thorough walk through of the home and made suggestions and provided contact information of the different vendors they could contact. The next step was to put Mitch and Holley in touch with a local lender, CMG Financial, that could help them understand their financial picture and buying power. Once they understood the financial piece we were off to the races to help them find a new home and marketing their current home. As a result of the Gray Fox Realty Full-Service, Flat-Fee system this family was able to transition to their dream home and keep their equity. 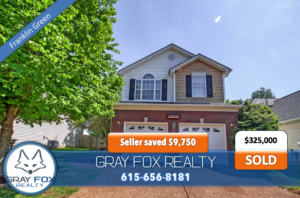 They saved $8,360 when selling their Franklin Green home with Gray Fox Realty. This really helped by giving the sellers more buying power as we helped them find, negotiate and close on a new home! If you want to know how to get more buying power and keep your equity so you can invest more in a new home like Mitch and Holley, click here and Mike or I will get in touch with you to set up your in-home consult. If you are looking to purchase a home the guys at Gray Fox Realty can assist you. Start your search here.